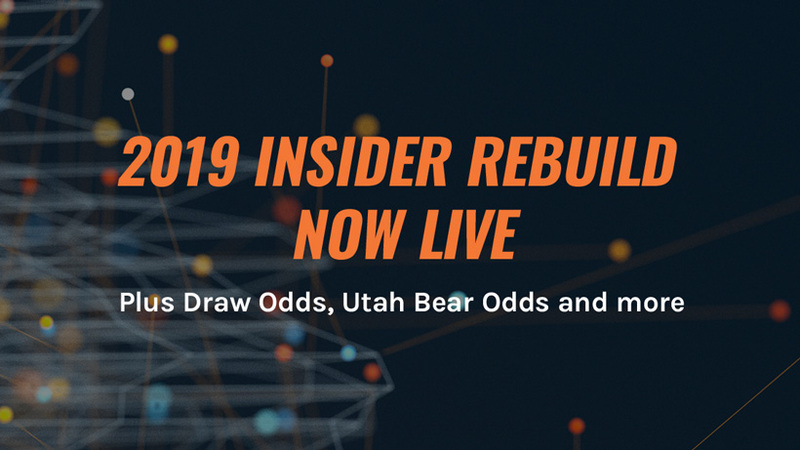 We are excited to announce that our 2019 INSIDER Rebuild and Draw Odds updates are now live! If you missed our last update, the past six months have been spent completely rebuilding everything on INSIDER. The INSIDER research platform just hit our four year anniversary, so it was time for a completely new set of code to increase performance and allow more research functionality; these new enhancements are huge for all users! You will see a new interface, faster load times, additional filtering functionality and new enhancements on Draw Odds. You'll now see all the updated information on the standalone Draw Odds page, Filtering 2.0 and Unit Profiles. 2019 DRAW ODDS & INSIDER REBUILD ARE LIVE! Each year we find more and more ways to add enhancements to our Draw Odds platform, and this year we completely redesigned the INSIDER product from the ground up. Load times are now faster than ever! So now, you'll be able to get your research data faster allowing you to bounce between pages without slow load times! The more data points you add to a system, typically the slower the system performs. Not anymore! We made it a goal to squash slow load times, and we are happy to say that for 2019, Draw Odds, Filtering 2.0 and Unit Profiles load times are much, much faster. The most accurate draw odds — just got better in 2019! 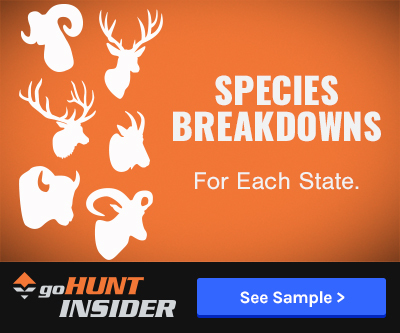 Every state and unit has been updated to show the latest draw odds. You'll now be able to see exactly how the 2018 draw played out to help you decide how to apply in 2019. The result of these updates further showcases us as having the most accurate draw odds in the industry. Year-over-year draw odds view showing an applicant at the 8 point level. 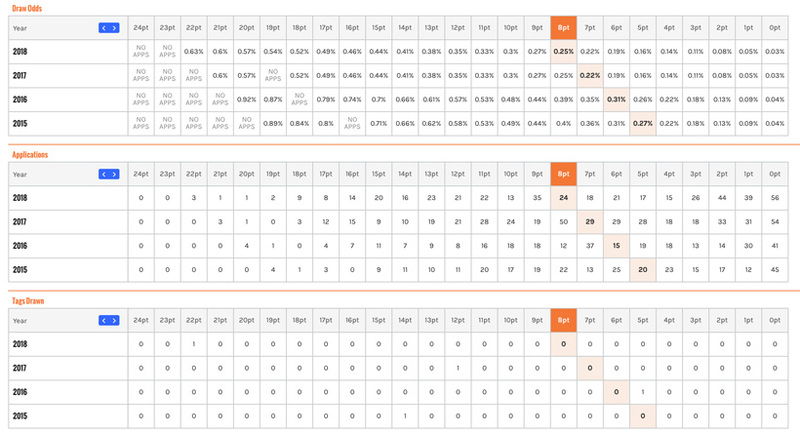 You'll be able to see trends in draw odds, point creep, applications and tags drawn. Along with the updated odds on the standalone draw odds experience page, each unit also has it's own detailed draw odds page where you can track trends even further with our year-over-year draw odds data. You’ll see exactly how the draws have played out for each state through the years (tracking point creep) and you’ll be able to track the trends at your point level. Throughout the INSIDER Rebuild, we were hard at work on new enhancements to further benefit your research plan. If you missed our last INSIDER update, we now break out the Applications By Point Level BELOW the draw cut-off line in Wyoming and you can see those trends for the past four years. For the first time, you can see exactly how many applicants you might be competing with for licenses going into the 2019 draw. Previously you only had a total of how many didn’t draw and had no idea how many of those might have been at your same point level. Now you do, and it’s one more critical piece of the puzzle that can help put a tag in your pocket! Utah black bear draw odds! We are excited to announce that we now have Utah black bear draw odds for both residents and nonresidents! Last year we added black bear draw odds for Colorado, Idaho, Nevada, New Mexico, and Oregon. You’ll be able to see draw odds for black bear under Filtering 2.0 and the standalone Draw Odds page for six western states. 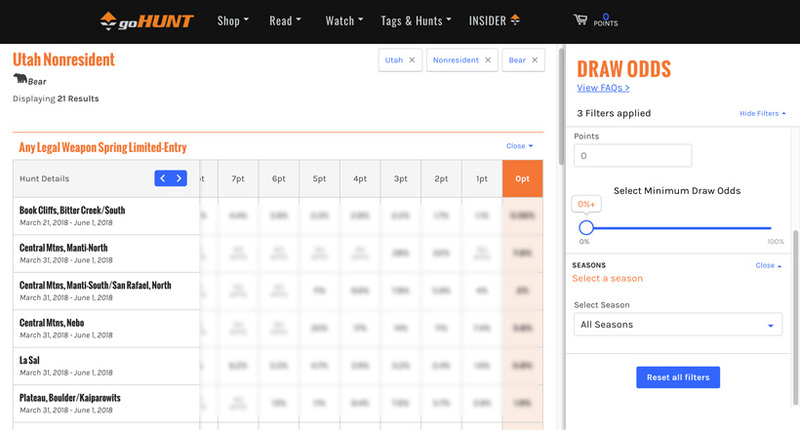 Screenshot of selecting youth draw odds in Utah on Filtering 2.0. You'll be able to see how youth applied on every species. Stay tuned for more enhancements we are coming out with in 2019! In the following weeks, we will be releasing more youth odds, and season dates when we receive them from the states. Feel free to reach out to us at any time if you have questions. Best of luck in the 2019 draws. 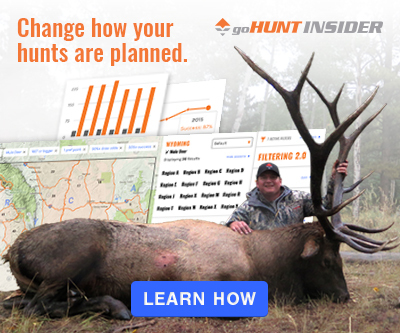 In Oregon when two hunts are listed for the same unit ie: cow versus bull or any elk it is hard to determine which hunt is which? Hey Rick. Yes, you are correct. Washington will be our next state on INSIDER and will be live this year before the application deadline. We can't wait to get it out there for everyone! I heard Washington State is going to be added soon is that true? Hopefully one day we will see a gohunt app. That would be awesome. I’d like to see Alaska on here as well. Currently we do not have plans to add CWMU hunts, due to the fact that they are only applicable to residents and they occur entirely on private land. The rules/regs and season dates are somewhat complex and in turn it's likely to generate more questions than we have good data and understanding of those private land areas. Hopefully that clarifies it, let me know if you have any further questions or if I can help you out in any way! Is there any chance that you guys will add Utah CWMU odds in future updates? With the vast units available, it is extremely difficult to know odds for every one of them. Hi Richard. Sorry for the difficulty with the sliders. That's an issue on our end, and we are working on a fix which should go live this week. As for the "top menu bar" thing you're seeing, will you please take a screenshot and email it to insider.support@gohunt.com? Appreciate the feedback and sorry again for the inconvenience! Since joining gohunt as an Insider, I've mostly been using Safari on my iPad to research hunting opportunities for 2019 and beyond. But since the Insider Rebuild, it's been nearly impossible to use the Filtering 2.0 and the Draw Odds sections. Specifically, the slider bars in the filters section act like they are having a seizure and don't work well, and the pages, particularly the top menu bar, don't seem to load properly. Is anyone else having these problems? Any feedback on how I can fix this, or is it a webpage problem? Hey Jason. Sorry for the late response. I was at the Sheep Show all weekend. Yes, those rumors are 100% true. 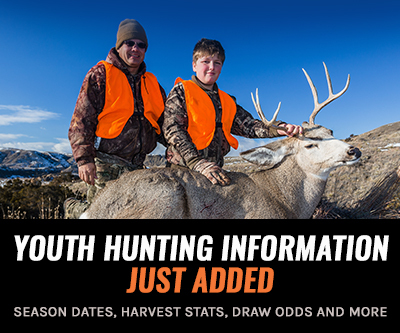 We will have Washington and Kansas on goHUNT before their application deadlines. Any truth to the rumors you are adding WA this year? Yes, Filtering 2.0, unit profiles, and stand alone draw odds are all updated. We genuinely appreciate the feedback! I will cycle it through the team and we will see if we can add those features. Ultimately we want it to work as seamlessly and efficient as possible and it if makes sense to add them and we can, we will. Thanks again! Any chance you folks could create a slider bar where you enter the points so if you were a person applying with 15 points you could set a minimum so all of the low points units didn't show up? I think a lot of people would use this. Maybe instead of a slider bar you could just have a min max point input location. Then only the units for that point range appear. I realize you can select with a % chance of being drawn and thats nice and all but it doesn't does not eliminate the lower point units. Could you also make a quick link at the top for filtering 2.0 so I dont have to play cat and mouse with that pop-up screen at the top of the page 5 times before it finally allows me to select something? For some reason when I move my mouse using Firefox it disappears constantly. Several other users I have talked to are annoyed by this as well.